The Ottawa Food Bank is pleased to host its inaugural Ottawa Food Security Conference, with the this year’s theme being A Path to Food Security. This conference aims to develop and grow the discourse around food security in Ottawa through knowledge sharing and professional development. 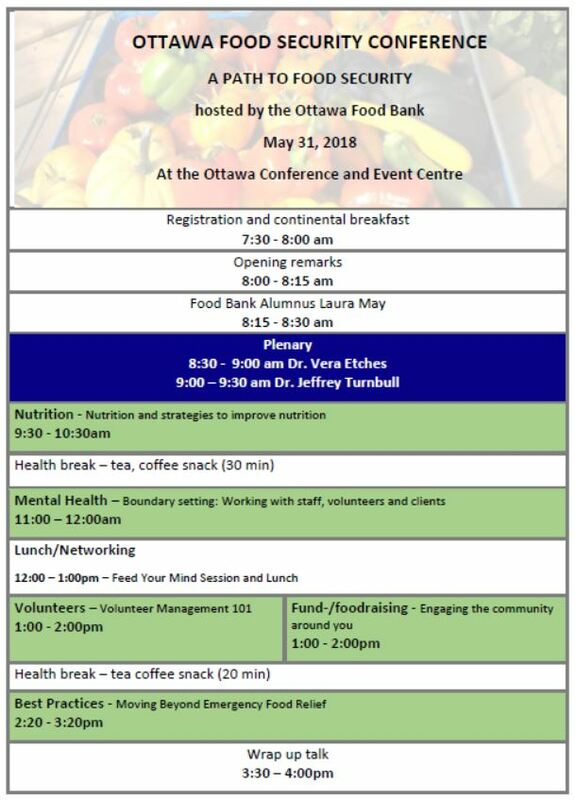 Registration is open to member agencies of the Ottawa Food Bank, representatives from all levels of government, as well as stakeholders in our community with concerns surrounding food security, health care, housing, and poverty. Registration opens on Thursday, March 15 and closes Wednesday, April 25 (or when tickets sell out). To register, please RSVP though the link that has been sent your way with your invitation. Didn’t receive an invitation and wish to attend? Please contact Alexandra for access to registration. Please note that some details are still subject to change.